Certified nurse assisting is one of the largest health care profession in the United States. The Bureau of Labor Statistics indicates that employment among CNAs will grow faster than all other occupations through the year 2018. 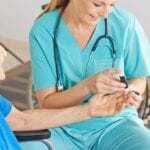 The expected growth is in part due to the aging population and longer life expectancy, which will place heavy demands on the health care industry. The Iowa Division of Health Facilities oversees CNA certification, including the training program, competency testing and state registry. Nurse assistant training programs provide essential knowledge and skills that prepare graduates for their roles in direct care administration. Classes cover core competencies such as the role of the nurse aide, safety, resident function and health, basic nursing care, and specialized patient care. Students develop patient care skills in a supervised lab and clinical setting. Program graduates must sit the state competency exam for placement on Iowa’s Direct Care Worker registry. Nurse assistants working in licensed skilled nursing facilities must be on the state’s nurse aide registry. One of the most common ways for inclusion on the registry is to complete state-approved training and pass the competency exam for automatic inclusion – as long as there are no disqualifying felonies in the candidate’s background. All registered nurse assistants possess a 6-digit ID number, which employers must verify before allowing the worker to provide direct care. Employers also have the responsibility of reporting cases of abuse, neglect or mistreatment of residents to the registry. Nurse assistants should check with the registry, especially when changing jobs, to ensure that employers report relevant employment histories – to maintain their active status on the registry. Guidelines and other requirements for working depend on where the nurse assistant plans to work. For instance, some facilities may request further education, such as training to care for patients with specialized needs or to administer medication. One of the key prerequisites for entry into Iowa’s nurse assistant training programs is a criminal-free background. The approved training provider will ask all prospective students to complete the background check at the time of registration. If you have a prior criminal conviction or a history of abuse, it could delay or prevent your participation in the clinical rotation, which is an essential aspect of the training program. While a high school diploma is not required for training, a prospective employer may be partial to nursing assistants with a high school diploma or GED equivalent. More than 30 percent of nurse assistants move on to other careers in healthcare. A high school diploma is a valuable asset if you plan to pursue further studies. Seasonal influenza, MMR, Hepatitis B and Varicella vaccines. Individuals wishing to become a CNA in Iowa must enroll in a state-approved 75-hour training course. The 75-instructional hours comprises of 45 hours in the classroom and lab (usually 30 and 15 respectively) and a required 30 hours for the clinical rotation. Training equips students with knowledge and basic nursing skills needed to care for residents in various long term care settings. Although teaching methods and duration of the training varies from one provider to the other, the course content remains the same. Training providers must emphasize safe, compassionate and effective care for residents. Key topics include personal care, grooming, safety, hygiene, infection control, vital signs, communication, anatomy, medical terminology, and responding to emergencies. Students also learn how to address the psychological needs of patients and provide basic care for common injuries. During the lab and clinical rotation, students provide hands-on care under the direction of licensed nurses. Both the lab and clinical rotation should cover the list of essential skills in preparation for the state’s skills evaluation. Training programs run from 2 to 4 weeks, depending on the schedule. Training costs an average of $350 to $475 at Iowa’s colleges and private institutions. Your employer must cover the cost of training and testing if you’re employed in a certified skilled nursing facility. Additional expenses include textbooks, course materials, registration fees, state certification exam, uniform and shoes for the clinical rotation. Unfortunately, most sources of financial aid won’t cover the cost of nurse assistant training. If you obtain employment at a certified facility before you complete the course, the facility must reimburse the full cost of training and testing. If you obtain employment within 12 months of completing the program, the nursing home must reimburse the costs incurred for training and testing on a prorated basis. In order to qualify for reimbursement, you must keep a copy of all receipts, pay with your personal funds and enroll in state-approved training programs only. Iowa Direct Care Worker registry exam is available at your training facility. The two-part exam comprises of a knowledge and a skills evaluation. The test center will administer the 100-multiple choice knowledge exam online. Candidates must score 70 percent or higher to pass the knowledge test. The skill exam tests candidates’ performance of 7 skills in a mock-clinical environment. The administrator will select randomly from the list of 32 essential skill all nurse assistants should know. You must perform the critical aspects of each skill in order to pass the exam. You can take the exam up to three times. If you do not obtain a passing score by the third test, you must complete another 75 hours of state-approved training before retaking both components of the evaluation. If you pass both the knowledge and skills exam and meet the state’s criminal background requirements, your name will be automatically added to the Direct Care Worker Registry within 14 business days. 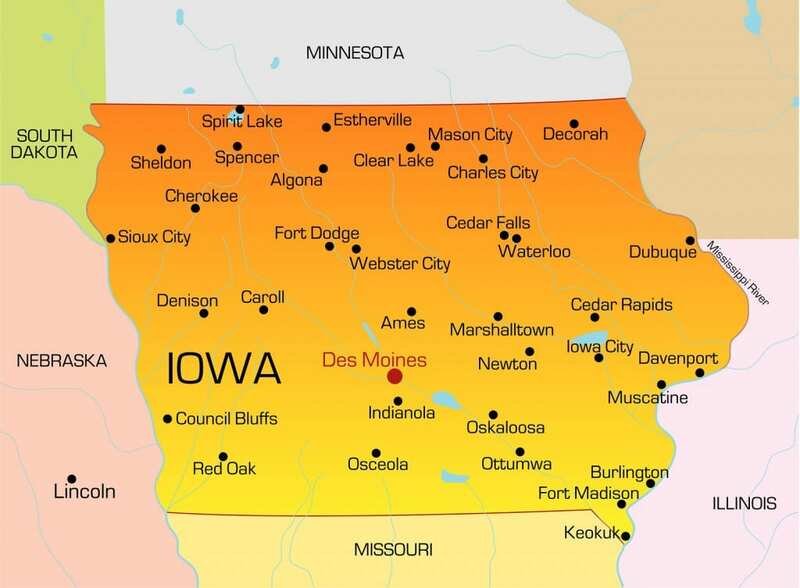 If you’re an out-of-state CNA, you can transfer your license to Iowa through reciprocity. The registry processes applications within 2 working days of receipt. Your Iowa CNA certification will remain in good standing as long as there are no reports of neglect or abuse. You can maintain your active status on the registry if you work as a CNA at certified long term care facilities, such as swing bed units and nursing homes, for at least one 8-hour shift over the 24-month period. The nursing home should report your employment to the registry.